and assorted budgies and Canaries. Enquires 09 357 6389 Christine. NZ Finch breeders bird fair including hook beaks. 9th May, 9am to 12 oclock at Ellerslie War Memorial hall. See the full story at: www.avesinternational.com/AB202.html"
An ongoing court case in Auckland, New Zealand, where two men were charged with importing a number of parrot eggs from Thailand was concluded last week when both were found guilty. Both received prison terms. The New Zealand Herald newspaper articles below followed this story from initial discovery to sentencing. The Minsitry of Agriculture and Forestry last night raided the property of Jim Bradshaw, a Budgie breeder in south Auckland. MAF suspects that the birds may be infected with Psittacine Pox, a virus that could threaten native New Zealand bird species. 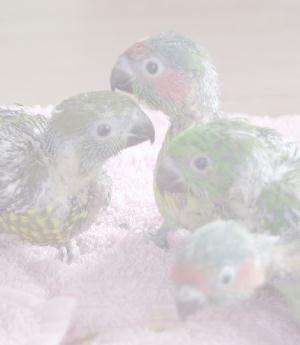 The birds seized included budgies, rosellas and a 35year old pet Cockatiel. Mr Bradshaw will be attempting to get a court injunction to prevent the destruction of his birds by MAF. Since the first report of Psittacine Pox was reported about a month ago, several parrot breeders, exporters and retailers have been visited by MAF with one exporter having all of his birds including Rosella, Lorikeets and Cockatoos seized. The exporter expects that all his birds are to be destroyed no matter what the outcome of testing for the Pox virus. The apparent reason for MAF action against breeders and exporters is to try and prevent the release of the Pox virus into the wild. However, its has been known from the first report of this virus in the Lorylink mailing list that the virus was only found in wild Rosellas that had been trapped and onsold or exported. I dont know if you are aware of a courier service in the nth island, that is starting up. It is run by Janice Cusack and her brother who is doing the pickups, Brian Cusack in Auckland. It is a once a fortnight service, on a Thursday only. They leave Auckland, and have pickup points at Hamilton, Rotorua, Taupo, Hastings, Palmerston North, Wanganui, then to Taranaki, Eltham Bird Centre, Inglewood at Ian Selby, Printer, Old BNZ building Inglewood. Then they return via Hamilton and to Auckland. This is a cash only service of $12.00 for a proper wooden bird carrying box. They can be contacted at 09 433 8895 preferably A/H evenings or weekends as they all work. They are keen for the word to get around and are grateful for any advertising they can get to cover costs. They are committed till christmas and will assess it again then. Five of the worlds rarest birds have been beaten to death in an attack at a Chrictchurch (New Zealand) wildlife reserve. Two Black Stilts, a pair of Shore Plovers and a Campbell Island Teal were killed. The Dept of Conservation reports three of the birds had been cleared for release back into the wild. A hero cockatoo slain trying to protect its master from knife-weilding assailants may prove the star witness in the trial of its owner's suspected killers. Dallas prosecutors showed a grand jury DNA evidence from blood samples found at the scene they say links two men arrested in the case to the home of the bird's owner. The blood apparently came from a wound the bird pecked on the head of one of the suspects. ... and this one also from Teletext that I could not resist. British detectives are investigating the mystery of a hamster found driving a toy racing car along a beachfront at a northern seaside resort. The hamster was handed in by a member of the public who found him cruising through Cleveleys, near Blackpool, in the modified toy which he powered by a treadmill. Officers removed "Speedy" from the car after he made several escape attempts from the front desk and took him to a nearby animal sanctuary. Kellie has decided to continue with publishing the Lory-Link newsletter as there is now sufficient support to allow this. The next issue is due to be distributed in two weeks so any contributions would be most welcome - articles, ads, etc..
Australian police have issued an APB (All Parrots Bulletin) for Hector the galah, a talkative pink and gray bird they fear was stolen from a Sydney pet shop. Hector had sat cheerfully at the front door of Doug Eyre's suburban pet shop for 31 years, delighting passers-by with cheerful chatter that included "Give me a kiss," "Hector's got a cough" and "See you later, mate." But the galah, a bird similar to a cockatoo, went missing last Saturday. Police issued a statement earlier this week which said Hector was last seen being carried off in his cage by a grey-haired woman in her 50s and placed into a car. "Police are investigating reports that the galah may have been 'liberated' by a welfare group concerned at Hector's caging," the statement said. "Hector is still missing," a police spokesman said on Thursday. Eyre fears his feathered friend has become an ex-parrot. "Our family is not taking this too well but a lot of people have been coming in, asking where he's gone and crying when they find out he was stolen," Eyre said. Hector's cause has been championed by The Daily Telegraph newspaper. The Sydney tabloid ran a front-page photo of the bird on Wednesday next to the headline: "Give the Parrot Back." "What kind of people steal a talking galah that has been part of a community for 31 years," the newspaper demanded. On Thursday, the Telegraph ran another front-page story containing pleas for his return from high-profile community members including Prime Minister John Howard. "I urge the culprit to return Hector for the continuing enjoyment of local passers-by," Howard told the newspaper. The New South Wales state premier, Bob Carr, added: "My simple plea is this: bring Hector back safe and well." Galahs are found across the Australian mainland and can live for up to 80 years. In rural Australia flocks of hundreds of galahs are regarded as pests who eat stockfeed. Isn't this nice, the Lorylink website gets recognised and given a award. Whats special about this one is that its from a group that only reviews web sites about parrots. THANKS Parrot Portal. Make sure to visit the Parrot Portal, click on the award image shown below. We visited your site recently and thought it was really good.. so good, in fact, that we gave it an award. If you'd like to display our award you can visit http://www.poozleanimus.com/coolinfo.htm to download graphics and links (if you wish) or just read about how we choose sites for our award. In any case, good stuff and congratulations on having such a cool site. Tile pattern: Baby Scaly and Musk lorikeets.